Styled with a vintage feel, this elegant 9ct white gold ring is styled with a shaped cluster of sparkling diamonds, along with diamond set shoulders and sophisticated milgrain detailing. 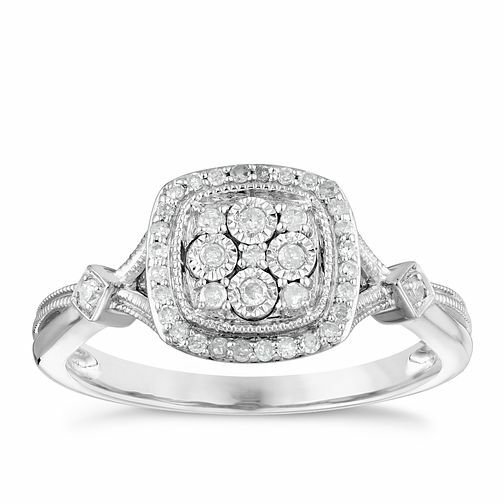 9ct White Gold 0.15 Carat Diamond Cluster Ring is rated 5.0 out of 5 by 2. Rated 5 out of 5 by Anonymous from So stunning Absolutely beautiful, so delicate, not as small as I expected but also not too big either, has a beautiful vintage look to it, This picture does not do this ring any justice, it's so sparkly and so stunning Impressed with the size of the shank too, nothing spared here. Very happy.